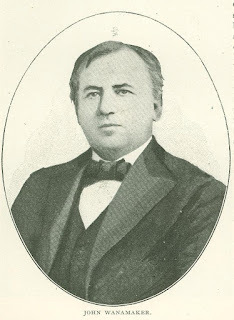 John Wanamaker's grandfather went from New Jersey, in about 1815, to Indiana. In due time his three sons went back east to grow up with the country. John Wanamaker was the son of one of these sons, and he was born in Philadelphia in 1837. He went to school from the time he could until he was fourteen years of age, and then he "accepted a position," as the local papers say, at a dollar and a half per week in a Market Street retail store. He polished up the handles of the big front door and did other useful and honorable work that his employer wanted done, and before anybody knew how it happened he was skilled in all the details of running a store. He has never forgotten a thing about these details, but he has added to such knowledge an unsurpassed skill in mercan­tile generalship. As a mercantile soldier he can not only carry a gun, but he can plan a battle and conduct a cam­paign. In Phila­delphia and New York he has, first and last, bought and sold, to the value of many hundreds of millions of dollars, everything that could gracefully and conveniently be taken in and out of a store. Almost every field in the whole mercan­tile area has received his attention - and to his profit. Grand total result (so far as an accountant would report) millions of dol­lars. When President Harrison called Mr. Wanamaker to his cabinet, many people were displeased, but most people thought it was a good appointment. A merchant, a churchman, a Sunday-school manager, a scrupulous and punctilious man, and an independent though ardent Republican, some regarded him as unfit for usefulness in the practical political field. Opinions may still be divided on this point except in this respect, to wit; he had no trouble in doing a good job as postmaster-general. Organization, system, method, business mech­anism, were all exactly in his line, and he soon had the com­plexities of the postal depart­ment at his finger ends. He instituted valu­able methods and corrected some bad prac­tices. He spread the fast-mail ser­vice and opened up sea post­ offices in which foreign mails are distributed and made up on the sea. He favored the establish­ment of a postal telegraph system and agitated many other changes. The department is better today for his having been at the head of it. Mr. Wanamaker has long been in command of a great Sunday ­school in Philadelphia, which started with twenty or thirty pupils and now has some­thing like three thousand. Almost every good enterprise of a Christian character in Philadelphia in the past forty years has had Mr. Wanamaker's assistance. He has also been connected with a very large proportion of the worthy business enter­prises. These relations have caused him to be better known to the people of the country generally than any other citizen of the Quaker City. His theory of life and busi­ness is well described in Peter Cooper's statement about himself made at the com­plimentary banquet given to him once in New York. Mr. Cooper said: "While I have always recognized that the object of business is to make money in an honorable manner, I have endeavored to remember that the object of life is to do good. Hence I have been ready to engage in all new enterprises and, without incurring debt, to risk the means which I have acquired in their promotion, provided they seemed to me calculated to advance the general good." Mr. Wanamaker has given quite liberal expression to his views on many subjects in the public prints. He is an "anti-ma­chinist" in politics, and does not train well under the direction of bosses. And yet he was a hardworking Republican National Committeeman in 1888, and has done an enormous amount of strenuous political duty in accord and cooperation with the regular Republican organization. If all citizens of our large cities would give the same personal attention to city affairs that Mr. Wanamaker has given to the affairs of Philadelphia, our towns would be better governed and our city scandals fewer. He gave a great amount of personal attention to the problem of a satisfactory water supply in Philadelphia. On one occasion he offered to purchase the gas plant of the city at a higher price than the city was about to accept for it, and not long ago he offered a large amount in excess of the price paid for the city's street-railway franchise. He was a power in the Centen­nial Exposition work of 1876, and he gave much attention to the celebration in 1882 of the two hundredth birthday of the city. He was one of the founders of the Penny Savings Bank in Philadelphia, one of the highest class institutions of its kind in the United States. He is quoted as having said once "Thinking, trying, toiling and trusting is all of my biography. "It is certain that he will go on thinking, try­ing, toiling and trusting until his present broad and wholesome activity is ended in. the ending of life. Originally published in Cosmopolitan Magazine. May 1902.